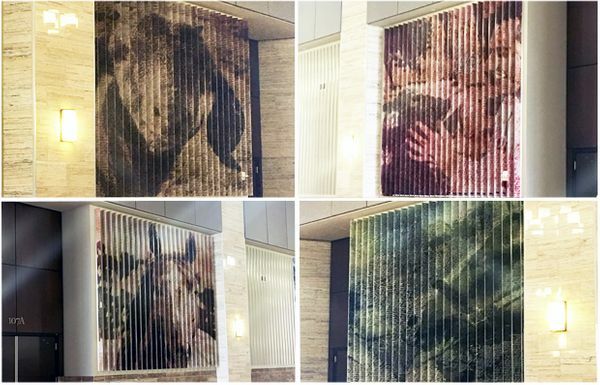 After months of planning, Texas A&M’s College of Veterinary Medicine & Biomedical Services is getting a new look with an incredible installation of 16 unique murals composed of lenticular fins. The installation captures the dedication it takes each student to complete their education, reflects the work they do every day and shows the compassionate, strong bond between humans and animals. The installation spans the entire main corridor entry of the College of Veterinary Medicine & Biomedical Services. Each fin composing the murals is embellished with detailed artwork that reveal different images depending from which side they are approached. The drawings behind the images on each fin are the words of the veterinarian oath each student takes upon becoming a licensed professional veterinarian. From an up-close perspective, each fin appears to be nothing but words. Stepping back, the viewer can see the broader images created by the fins. When walking down the corridor in one direction, images of domestic animals interacting with veterinary students appear While walking in the opposite direction, the images change to the individual animals cared for by A&M veterinarians. This installation provides an immersive look into the dedication and commitment of every aspiring veterinarian. The imagery, state-of-the-art concept and fabrication articulate the message and mission of this 21st century school, while also creating a space that feels contemporary yet traditionally Texan. The uniqueness and creativity behind the piece creates engagement and conversation among students, faculty and the greater community. With their Art + Artisans partnership, Texas A&M’s College of Veterinary Medicine & Biomedical Services was able to bring true meaning to their new space.